Having trouble viewing this HTML e-mail? Click here to view this mail in your web browser. NOW AVAILABLE! ONLY $149.95 FOR A LIMITED TIME! 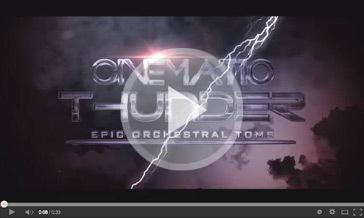 We are proud to present Vir2’s latest virtual instrument, Cinematic Thunder: Epic Orchestral Toms. Recorded in a large concert hall in central California from three mic positions for complete flexibility, Cinematic Thunder delivers an epic sound. From soft and warm to big and bombastic, Cinematic Thunder is an absolute and indispensable production tool. Cinematic Thunder contains four master patches: Solo Sticks, Solo Mallets, Group Hits and Group Random. The master patches are the natural sound as they were recorded. Each master patch has a corresponding “Slam” patch. The slam versions have a bigger, more aggressive sound that is perfect for your next trailer or action cue. Each drum in the “Solo” patches has left and right hand hits, flams, 3-stroke ruffs, 5-stroke ruffs, and rolls. There are also combo hits in the highest octave. The Combo hits consist of two toms being struck simultaneously. We sampled hits from highest pairs to lowest. In other words, 8″&10″ toms, 10″&12″ toms, 12″&14″ toms, 14″&16″ toms, and 16″&18″ toms. Each drum in the “Group Hits” patch has left and right hand hits, and flams. Like the “Solo” patches, there are also combo hits in the highest octave. The “Group Random” patch is a great patch for adding big accents, it contains only single hits and flams played at maximum volume (fff). 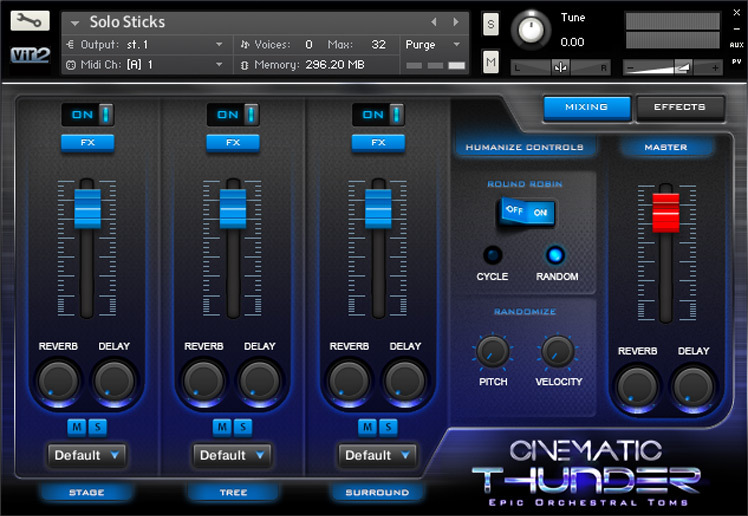 Cinematic Thunder is powered by the industry-leading Kontakt engine. It is compatible with VST, AudioUnit, AAX (Pro Tools 10 & 11) and RTAS (Pro Tools 9 & 10) plug-in formats allowing it to work seamlessly within any major sequencer, in addition to standalone use. Database dei virus interno non č aggiornato. This entry was posted in Plug In, Samples Libraries, Software, Vst and tagged big fish audio, Cinematic thunder, epic percussions. Bookmark the permalink.